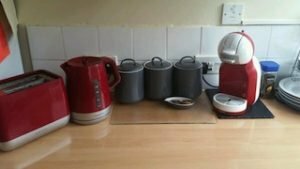 A collection of red and grey kitchen accessories, to include a coffee machine, a kettle, a two slice toaster, a tea strainer and tea, coffee and sugar canisters. 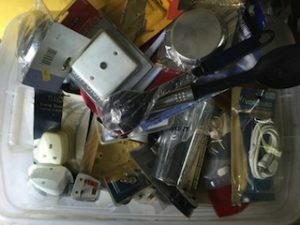 A collection of brand new home accessories, to include utensils, wall sockets, screw drivers, plugs etc. 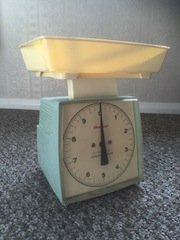 A 1960’s duck egg blue and cream vintage scale set. 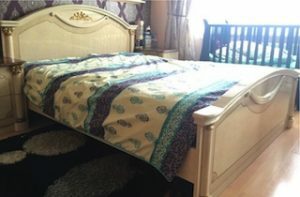 A hand painted cream and gold Italian king size bed frame and mattress, together with a matching pair of bedside drawers. 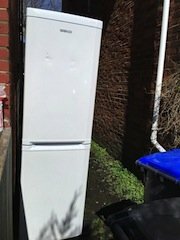 A tall standing white Beko 60/40 frost free fridge freezer. 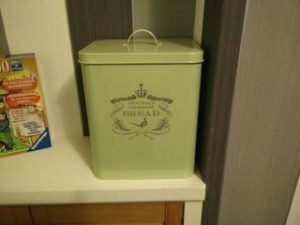 A vintage farmhouse style large lime green metal bred bin, decorated with a pheasant. 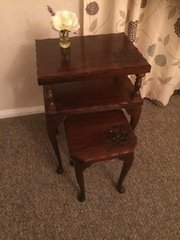 A nest of three solid mahogany square side tables, each carved to the top with a rose. 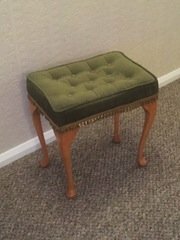 A vintage rectangular solid pine piano stool, upholstered to the seat in olive green velour with button and fringe detailing. 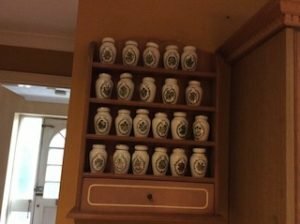 A solid pine vintage one drawer wall mountable spice rack, together with a collection of plant patterned ceramic spice jars. 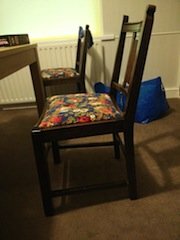 A pair of hand painted black solid wood dining chairs, upholstered to the seats in colourful floral patterned fabric. 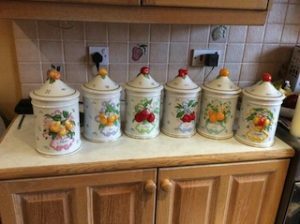 A set of vintage colourful fruit patterned ceramic cylindrical kitchen canisters, to include flour, tea, coffee etc. 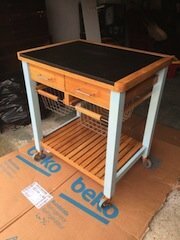 A vinyl topped solid oak butchers block on castors, having two drawers above two wire drawers and a shelf. 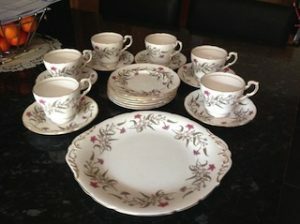 A vintage floral patterned fine bone China part tea service, to include a tea tray, teacups, saucers and side plates. 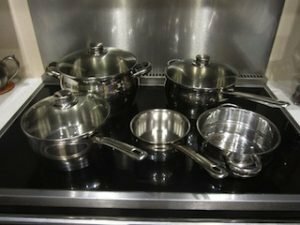 A five piece stainless steel pan set, to include a lidded two handled saucepan, two lidded saucepans, a soup pan and a colander. 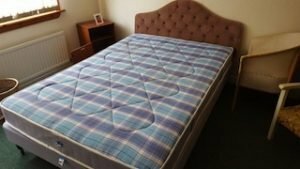 A chocolate brown velour double headboard, together with a solid pine double bed and a double mattress. 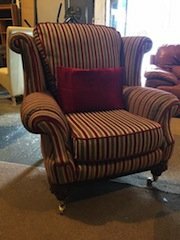 A vintage wing back fireside armchair on brass castors, upholstered in red striped patterned fabric. A four piece solid pine sofa suite, to include a two seater high back sofa, a two seater low back sofa, an armchair and matching footstool. 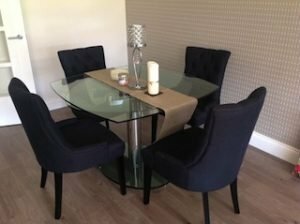 A glass and chrome dining table, together with four high back dining chairs on solid wood legs, upholstered in navy blue fabric. 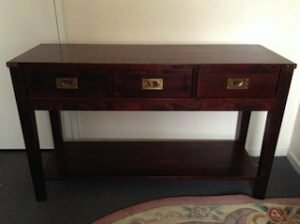 A solid mahogany vintage console sideboard, having three brass handled drawers above an under shelf. 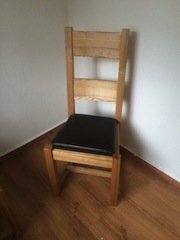 A solid pine high back dining/ hall chair, upholstered to the seat in black authentic leather.